This research paper tries to look at the various experiences of fishing communities and government units at addressing impacts of CC and SLR. This research explores how these experiences are shaped by the differing knowledge, power, and resources interplay within a social system. To address this, an analysis of the social, economic, political, and cultural situations in the study areas as well as the local ordinances that relate to coastal resource management, gender, disaster risk management will be made. The research findings indicate that social actors interact, challenge, and maximize their knowledge, resources and power to produce either individual or collective measures and strategies for adaptation and resilience to CC and SLR across time. Generally, strategies undertaken by fishing households and communities reduce their vulnerability to CC and SLR impacts in the short term. The local governments’ challenging role is to provide development and adaptation continuum, where transformation of coping strategies into effective adaptation strategies can become more meaningful to local people. 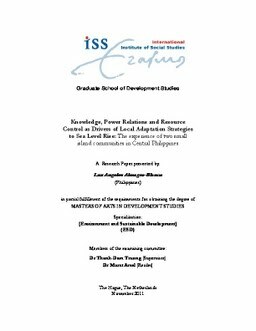 Relevance to Development Studies The growing and intense impacts of SLR in small island communities are concerns that need immediate attention. The knowledge to be gained from this study may help to understand that vulnerabilities and adaptation are socially constructed and thus requiring greater understanding on the complex interaction between social, political, cultural and economic factors.